Pour the bacon into a pot over medium heat, fry for 5 minutes or until it begins to brown. Add the vegetable broth and herbs, cover the pot and let cook for 10 minutes or until the carrots have cooked. Open the cans of lentils and pour the contents into a blender. You may need to do this in two separate portions if your blender is small. Add the bacon and carrot mixture to the lentils and blend until uniform. Pour the soup into a pot and heat then serve immediately. 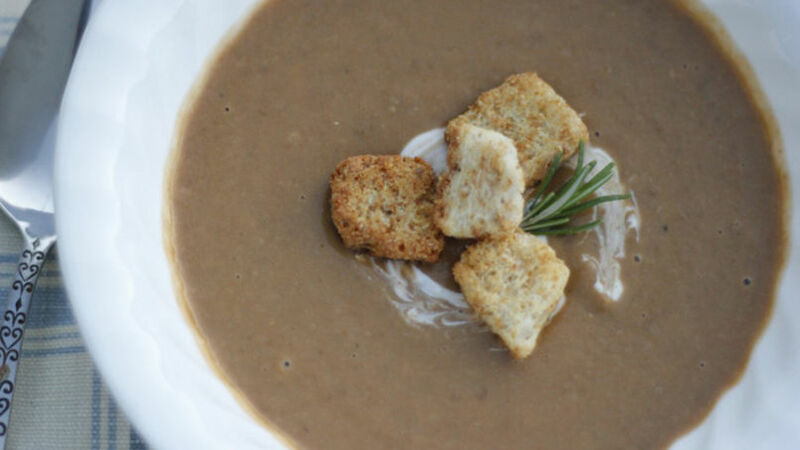 Serve the soup with croutons and a little cream if you desire. Use kitchen scissors to cut the bacon, it’ll save you time and energy. If you like spicy food, feel free to add a green serrano or chipotle chili peppers. These cold winter months are the perfect excuse to stay in and cook something warm and comforting. This is the time of year when I prepare a variety of soups ranging from vegetable soup to creams; the possibilities are endless! In my house, we enjoy beans and lentils so I always have them available in raw and canned form, especially Progresso® lentils because they're delicious and come with a sauce made with tomatoes, celery, onions, spinach and other veggies. So grab a few cans of lentils and add a few simple ingredients to create a delicious and mouthwatering cream. When I made this for my family I helped myself to seconds and my husband loved it so much he said he could eat it every day! I hope you like it as much as we do!